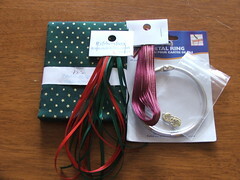 … from Andrea of the blog The Craft Room. 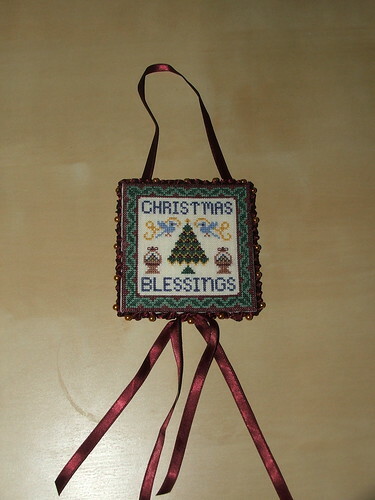 Andrea stitched Christmas Blessings by Milady’s Needle from the JCS ornament issue 2007 (coincidentally I also selected an ornament from that issue for my partner). As we all know, Andrea does beautiful stitching and finishing and this ornament is just stunning. I love it, it is beautiful. You can also see the lovely extra’s Andrea included with the parcel. It was a wonderful surprise. Thank you so much Andrea. :)) It was my pleasure to stitch for you Cathy. She did a beautiful job on the ornie! So pretty! 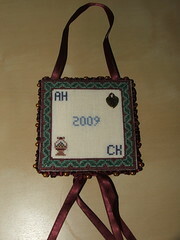 Lovely ornament – well done, Andrea! Oh what a gorgeous gift!! That’s really lovely and I love the ribbon finishing it. Makes it really stand out. That’s a very beautiful ornament that Andrea stitched for you. Lovely ornament. Love the photos of Felix, he is a naughty boy to do that LOL. Your wips are looking great, congratulations on finishing Peacock Cypher.